A placid fall lake scene is under blue skies with puffy white clouds. At the shore, a skiff with oars awaits the rower, who perhaps is the artist who came to paint. The foreground field is bounded by a rail fence to the right. The distant ridge of trees takes a purplish atmospheric tone. 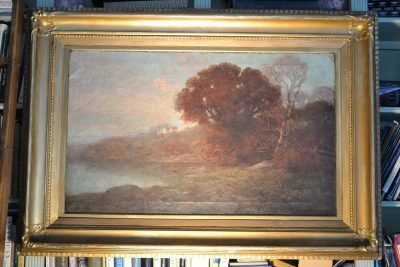 The deep coved antique frame is the original with later gilt. Apparently unsigned. Barbizon school. Overall 33″ by 47″. $1125.